First impressions are extremely important when it comes to meeting someone new. Whether we realize it or not, we tend to make quick “snap judgments” of the people that we meet based on that initial interaction. When you’re thinking about patronizing a business and exchanging your hard-earned money for their goods or services, well, first impressions are all the more important. How your business looks on the outside to potential customers may very well make or break a potential sale, and that applies to just about any brick and mortar company regardless of what industry you’re involved in. Our Custom Sign Company Is Here To Help Your Business! With flexible leasing options available coupled with our variety of sign materials that we use, there’s really nothing that our sign makers in Louisville can’t do for you and your business! Learn more about our sign making company on our services page. Keep reading below to learn what you should keep in mind in terms of how your business presents itself from the outside, and feel free to contact us with any questions. People passing by in cars might not be able to notice how clean your storefront is, but those who are walking by in a strip mall are likely to notice. The ground near your door should be swept clean and pressure washed routinely. Are Your Store Hours Clearly Presented? Though customers can view your store hours online, those passing by might be curious as to how late you’re open on a given day. If you’re a restaurant, your menu should be posted outside to attract customers. Overly-tinted windows — as well as dirty windows — tend to ward off would-be customers if they can’t see inside and get a feel for what their experience would be like before actually walking in and interacting with anyone. Make sure that your business is transparent in this sense. Does Your Business Display Any Credentials? If your company bears various accommodates or shining reviews online, consider printing them out or simply displaying them on your front door or somewhere near the entrance where passerby can read them. Customers that are on the fence about coming inside are more likely to venture in after reading about someone else’s positive experience. If no one knows who you are, what you do, or even what your brand name is, then you’re going to have a bad time. Why? Without a highly-visible, easy-to-read custom sign from a sign company like us, people aren’t even going to notice that your company exists. Contact Commonwealth Sign Company Today! 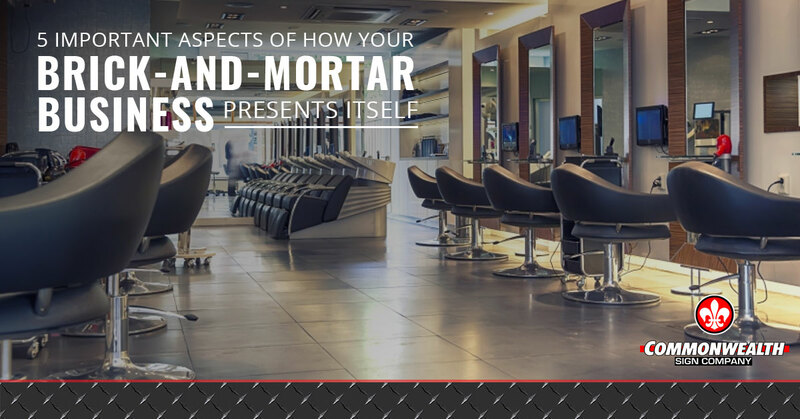 Though the forefront of marketing is online these days, customers still need a way to be directed to your physical brick-and-mortar business. Our custom sign company in Louisville can help! Contact the sign making professionals today to learn more and get started.